Comedy Dynamics to release Finesse Mitchell: The Spirit Told Me To Tell You on iTunes, Google Play, Amazon Prime Video, Xbox, Vimeo, Dish network and more February 19, 2019. 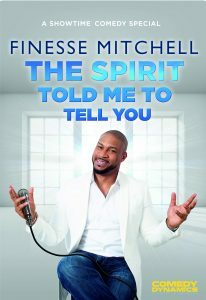 Finesse Mitchell: The Spirit Told Me To Tell You was directed by Devon Shepard and executive produced by Brian Volk-Weiss and Cisco Henson for Comedy Dynamics along with Finesse Mitchell, Adris Debarge and Adam Ginivisian. “Finesse showcases a full range of comedic talent with this hilarious debut stand up comedy special. ” said Brian Volk-Weiss, CEO of Comedy Dynamics.